Government reforms put prisoners and staff at risk. 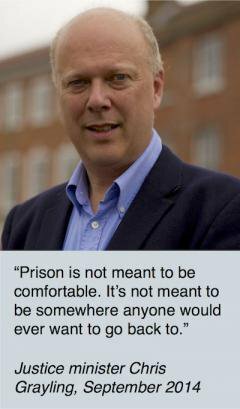 A frontline officer talks to Prison UK’s Alex Cavendish. (See also How to survive in prison, by a former inmate). Q. How would you say the job of being a prison officer has changed over the last few years? A. ‘More for less’ as that often repeated popular Tory slogan goes! There is less time for ‘good old’ prison officer duties i.e. face-to-face communications with prisoners and dealing with their ‘issues’. We’ve been pushed out of roles where prison officers were employed, and could utilise when working ‘on the landings’ – for example Offence Focused Groupwork. On a daily basis I just don’t have the time to attend to individual prisoners’ requests and issues. There appears to be a ‘if it can’t be quantified’ attitude – by ‘management’ – then it is not important. There is more emphasis now – via ‘management’ – on paper filling and box ticking to make it appear that the jobs are being carried out satisfactorily. For example, my daily duties are now broken down into slots of 15 minutes. At least twice, on a daily basis, my detail shows me as being in two places at the same time. Q. What impact has the 28 percent cut in staffing had on you and the colleagues you work with? A. There are less staff to complete all the daily tasks to a satisfactory level and, more importantly, far less time interacting with, and monitoring, prisoners and their behaviours – for example bullying, violence, substance misuse, vulnerabilities, etc. Also, there is lowered confidence in dealing with anti-social, pro-criminal behaviours due to lack of availability of staff. Q. How does overcrowding (if that is currently a problem in your own nick) impact on the way you can do your job? A. I’ll give an example. A typical wing has 94 single cells. Currently, a typical wing is holding 126 prisoners. That’s approximately 32 prisoners sharing cells originally built for one prisoner. This means more demands on staff time and the resources available within the wing/establishment. Also, everyday is a ‘ticking bomb’ due to prisoners fighting for attention, and for the use of limited facilities such as showers, phones, association equipment, etc. Q. Most of the prison officers I communicate with feel staff morale on the frontline is pretty much rock-bottom at the moment. What’s your own take on this? A. I would agree with that. However, most of the experienced staff help each other get through the day. There is a distinct feeling that the ‘management’ of the establishment is not that bothered about the frontline staff as long as all the relevant paperwork is signed and dated, for example wing diaries. There is an opinion that the calibre of ‘management’ within the prison service nowadays do not want to engage with officers or prisoners on a daily face-to-face basis - they are more happy to sit behind their computers looking at and making spreadsheets. In my first couple of years’ service I remember governors being based on wings and the ‘No. 1’ [governing governor] and the ‘Deputy’ making daily rounds of the prison talking to and observing staff and prisoners. I have yet to see the current ‘No. 1’ and ‘Deputy’ do this! This just reinforces officers’, and prisoners’, views that the prison ‘management’ isn’t interested in what is actually going on within the walls of their establishments. Q. Do you feel that safety – of staff and cons – has been compromised due to Chris Grayling’s ‘reforms’? If so, where do you see the real flashpoint and dangers? A. Without a doubt, yes! There is a distinct lack of staff presence during the ‘line route’ to and from activities which makes it a prime time for prisoners to ‘get even’, carry out assaults, ‘taxing’ [charging protection money] etc. Activities are regularly being curtailed due to lack of staff due to sickness, emergency escorts etc. Gym is a regular activity that is cancelled due to staff being re-deployed. Gang activity is on the increase, along with the availability of drugs – particularly the so-called ‘legal highs’. The prison’s security department has been depleted, along with the number of searches that used to take place, together with the number of available staff. Q. You’ve commented previously on a lack of support from management. How does this work in practice on the wings and has it got worse in recent years? A. ‘Management’ is rarely seen on the wings, within the grounds during the working day. It has been regularly commented on by officers that if the building where all these ‘managers’ are located was in London in would not make any difference to the current running of the establishment. I would say the quality of the ‘managers’ (governors!) has declined over the past ten years. It appears to me these new ‘managers’ are good at balance/spread sheets and looking at computers but they appear very hesitant in dealing with or communicating with officers and prisoners on a personal basis. Officers have a saying for the type of current ‘management’ and that is ‘management by e-mail’ as this appears to be the preferred method of communicating with staff and means that ‘management’ do not have to leave their offices and see what is being dealt with on a daily basis throughout the prison estate. Q. Can you give us an insight into the way the revised Incentives and Earned Policy (IEP) policy has impacted on your establishment since September 2013? A. It hasn’t made much of an impact, in my opinion! I see it as just another bureaucratic ‘exercise’ that diverts disciplinary cases from adjudications. Call me cynical, but these do not show up on monthly statistics! There was/is very little difference between a ‘standard’ and ‘enhanced’ prisoner and the privileges, etc. In all honesty I haven’t paid much attention to this policy as, like a lot of officers and prisoners, I do not rate this system much as it’s a poor substitute for the old disciplinary system. Q. What effect has so-called ‘legal highs’ had on your nick? Are these substances widely available at the moment and, if so, are they making your job more difficult and/or dangerous? A. This is one of the most frightening things that is worrying frontline officers. You don’t know, on a daily basis, if there is going to be a spate of prisoners using these and what strength they are using. Prisoners become violent, have an increase in strength, lose all awareness of where they are and the physical dangers to their bodies is worrying too. On the wing (NOMS)On one particular day we had 18 known cases that required medical attention i.e. ambulances. Prisoners now refer to these as ‘Mambulances!’It takes all of the wing officers to deal with just one prisoner who is having one of these ‘attacks’. This leaves the rest of the wing unsupervised, so you can draw your own conclusions as to what else could be happening, or could happen, when we are dealing with the use of these ‘legal highs’.They appear to be easily available and a popular method of entry into the prison is being thrown over the fence as the chances of staff stopping these ‘drops’ is minimal.If a prisoner is suspected of using these substances then they are automatically downgraded to the Basic IEP level.Q. Have you noticed any changes in the type of prisoner you are dealing with or the length of sentences they are serving? Have you seen the prison population ageing during your time in the job?A. There does appear to be more prisoners over 50 entering the establishment and the younger ones are more violent and willing to resort to violence. I believe this is because of how they have been treated during their ‘rise’ through the Criminal Justice System. In other words, they have been treated with kid gloves and the sanctions that have been applied or are available to punish them are a joke. They often say “And what are you going to do about it?” The answer to this has been not a lot or nothing and this has been imbedded in themQ. It’s often said that our prisons run on the basis of cooperation between staff and most cons – particularly in view of the numbers of prisoners on a wing in relation to the smaller number of prison officers now employed. What is your take on this? Are cons becoming more difficult to manage or work with? A. Yes, they are more difficult to manage. This, I believe, is due to staff not having time to talk with prisoners, and the same goes for prisoners as the new regimes that were brought in last year do not allow for prisoners and staff to slow down. It’s rush, rush, rush: get them out and get them to work! 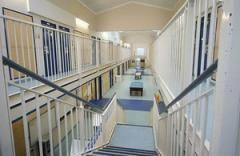 Most prisoners would like to go back to being ‘banged up’ during the lunchtime period as this forced them to slow down and relax. Now, because they are out [of cell] it increases tensions and I have noticed a lot more aggression shown between prisoner and prisoner particularly.Q. Have you ever met any cons in the last 20 years that you genuinely believed might have been wrongly convicted?A. I don’t know. But, I have met some who I believe should not have been sent to prison. For example one prisoner who ‘stole’ food thrown away by a well known supermarket into a skip. I think he was sent down for three months for this. He is now dead from overdosing after being released.Q. Do you get any job satisfaction from your work these days? How do you cope with the increased violence and the risks to your personal safety? Have you considered looking for an alternative career because of working conditions getting worse?A. Sometimes I get satisfaction but it’s very rare as we are too busy to take time on task and requests.I’m constantly worrying about my own and my colleagues’ safety. I’ve come to realise that I stand clear until enough staff arrive or the prisoners cease fighting each other or I withdraw as quickly as possible. I’m finding it very stressful and not just the violence but the workloads and staff cuts.I have – and am – seriously considering leaving. This is due to the increase in violence, reductions in officers and how ‘management’ treat us, particularly those at the higher end and, of course, politicians. The serving prison officer, who has 20 years' experience, communicated by email to Alex Cavendish. 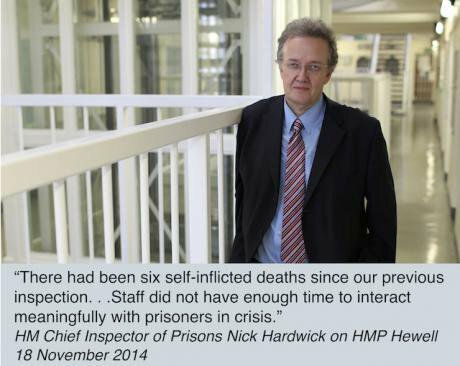 Thanks to Alex and his blog, Prison UK, where this interview first appeared.